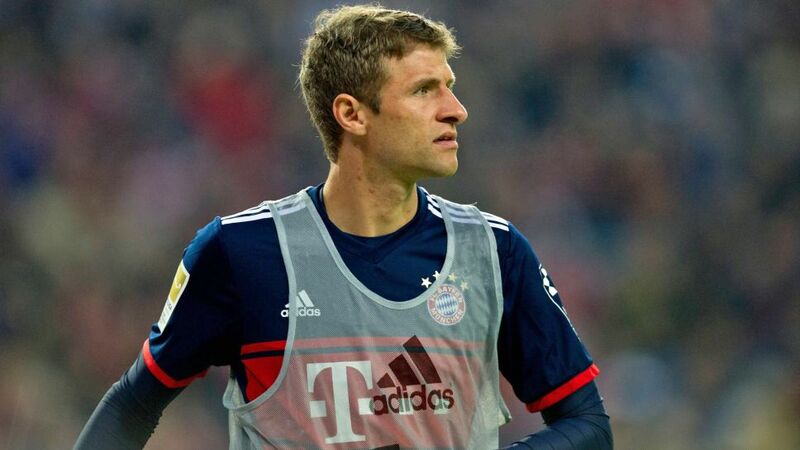 Bayern Munich forward Thomas Müller will be unavailable to the German champions for around three weeks after tearing a muscle in his right thigh during the 1-0 win over Hamburg on Saturday. The 28-year-old was a half-time substitute for James Rodriguez at the Volksparkstadion and picked up the injury shortly before he assisted Corentin Tolisso for the only goal of the game, before being replaced himself by Thiago after less than ten minutes on the pitch. The world champion underwent an MRI scan back in Munich on Sunday following the team’s return from Hamburg. Despite coach Jupp Heynckes remaining hopeful after the game, saying he hoped it was just cramp or a muscle hardening, the treble-winning coach will now be without a key performer for a busy period of Bayern’s season. Starting with back-to-back games against RB Leipzig in the DFB Cup and then the Bundesliga, the Bavarians also have a UEFA Champions League game in Glasgow against Celtic, as well as Der Klassiker against Borussia Dortmund that Müller is set to miss. Müller has been integral to the champions’ resurgence under Heynckes as they made up the five-point gap to leaders Dortmund in just two Bundesliga games. Quiz: How well do you know Thomas Müller?